Care for refugees: Grace, Kath and Chris prepare to travel to Scherger Immigration Detention Centre to minister to detainees. 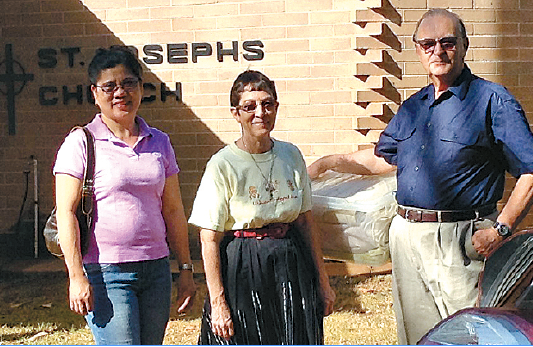 CATHOLIC detainees at Scherger Immigration Detention Centre have good reason to be thankful for the commitment of St Joseph’s Weipa parishioners. The parishioners are now in their third year of weekly visits to the centre. In the early days, they held a Liturgy of the Word with Communion service in a canvas tent at the centre. Cairns diocese priest Fr Kumaradhas Manuvel now visits once a month to celebrate Mass. The Catholic refugees are from Sri Lanka and Vietnam and between 60 and 70 men attend the Masses and Liturgy of the Word with Communion services. Parish pastoral leader Kath Newman is among a small group of St Joseph’s parishioners who visit the centre. She said the trip to the detention centre, located on part of the Scherger Royal Australian Air Force Base about 37kms from Weipa, could be challenging with a section of unsealed road a real problem in the wet season. “The first service was held on the Saturday before Palm Sunday 2011,” she said. “There were 27 Sri Lankan Tamils present. “After a further service on Easter Sunday, a commitment was made to go out weekly. that one of the detainees would translate. “Services would be held at 11am on a Saturday with the service in English and the Liturgy of the Word in both English and Tamil. Cairns Bishop James Foley then asked Fr Manuvel, stationed in Cairns, if he would go to Weipa once a month and visit the men at Scherger. Fr Manuvel was able to converse with them in Tamil, Ms Newman said. “He caught the Scherger bus at 8am on Saturdays and spent the mornings with the men,” she said. “The parishioners travelled out for Mass at 11am and brought Father back to Weipa afterwards. “Fr Manuvel celebrated Mass in Tamil and sometimes the men sang Tamil hymns. “Late in 2011, arrangements were made for the detention centre bus to bring some of the men to St Joseph’s for the Sunday Mass or service. “Every second week the bus brought between eight and 16 men accompanied by four or five security people. “The men are respectful, friendly and very appreciative of our visits.